ART is progress and artists are always forward-looking — innovative, experimental, creating and inventing newer forms of expression. Rarely does an artist apply the brakes and withdraw into the past, as though to turn the clock back and rediscover some forgotten images from yesterday. So when one of the greatest painters of our time, Anjoli Ela Menon takes such a decision, many questions are asked. Has she exhausted herself? Does she have nothing new to offer? Doesn’t she run the risk of repeating herself? Or is there more to what meets the eye? Anjolie isn’t explaining. "There are some rare moments in an artist’s life when something momentous happens occurs like the opening of a sealed window beyond which lies a whole new horizon hitherto unseen," says the lady who has done it all — from oils-on-canvas to glass sculptures to kitsch furniture and computer morphed mutations. Thus, she should well be entitled to take a break for the moment and dwell into associations from the past — the singular academic still life, a series of little heads that mesmerise and the aura of the human face with its typical dark circles around the eyes. "It is like an overlapped computer memory in which the animation of the past energises the truths and beliefs of yesterday and today," observes art writer Uma Nair. "Perhaps that is why in the series that she so positions and poignantly perceives, there is a tendency to play with the form and also invest her objects with an enormous spiritual significance." Also, there are impressions that have stayed with Anjolie from her frequent travels, such as the image of Jesus Christ — a motif that recurs with as much regularity as the peasant woman. For example, a Christ-like figure in Pyotr, is actually an Armenian priest. Then in Pastoral I, there is an image of an ebony-bodied Madonna figure with a little boy and three goats in black, mahogany and white. Stylistically, this is the old Anjolie at her expressionistic best, recreating the image of the mystic while arresting time in the picture frame. Explains the artist: "I just visited Leningrad and it brought back so many memories hidden in my inner recesses. Maybe, that is why you see a going back in time, to perhaps 10 years ago when I had worked on a series of elements and images." Another painting, of a melancholic woman, Binodini is inspired by her visit to Tagore’s Santiniketan recently. "My visit brought about such an immense sadness," she narrates. "I saw such a great institution in absolute shambles. I came back with a mix of nostalgia and anguish and that is how Binodini was born." Equally significant is Naroda Patia, Anjolie’s comment on the Gujarat carnage last year. 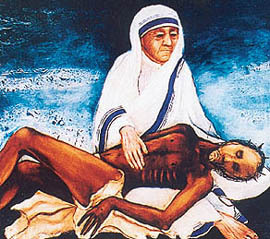 Here, a little boy is seen in utter confusion and anguish, sitting on the corpse of his dead mother. Horror and pathos blends into a confessional mode of sheer helplessness in the face of human brutality. Then there is a triptych, Nativity that is a confluence of colour and the tangle of human fallacy with an admission of reality. Each human figure appears to say something about the nature of creativity — the power of faith that has gone down generations. And then there is the most outstanding piece — a series of six small heads. As Nair comments, "Christ has an emotive evocation that is all at once in a deeply meditative mood while the Madonna-like figure with the orange-toned brush strokes has an innocence about it that is fetching. The six heads are like icons. They have been framed in the old masters’ style and they invite aesthetic opinions." Anjolie’s concerns, however, lie elsewhere. It has more to do with the contradiction of opposites, the co-existence of life and death, the ironies that accompany joy and sorrow. She points out that common day-to-day occurrences can carry a message that can at times, prove to be an eye-opener. "My studio in Delhi is located near a slum," she narrates. "I call it my basti. There I once saw this magnificent goat I wanted to photograph. But I was prevented with the warning that it was not to be touched as it would be sacrificed on Id. So here I watch these people feeding goats for months on end and then they butcher the same animals that have been fed by human hands and petted and loved."